What do you think about redesigning that rounded battery we all so know and love? That's exactly what the designers of this battery concept called the Hive thought about. 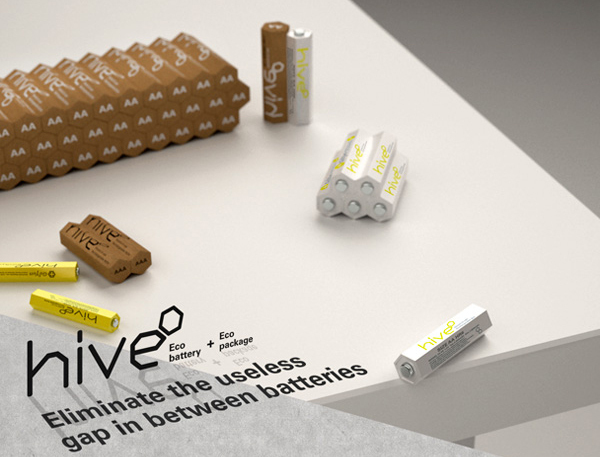 The idea behind the Hive battery is its hexagon design that will keep both AAA and AA batteries from rolling off tables causing havoc. The hexagon shaped batteries will also save up as much space as possible where rounded batteries only create useless gaps when stored together in packaging. These hexagon batteries look ultra cool too. I don't see why they wouldn't be able to maintain their odd shape and yet still fit in today's rounded chambers that we find in all of our gadgets. There is a problem when thinking about the science of the actual battery construction however. Whether it's possible to maintain the same level of energy as the traditional cylindrical shape with these hexagon shaped batteries is up to the scientists and engineers. Sanyo, please out some rechargeable hexagon Eneloops!